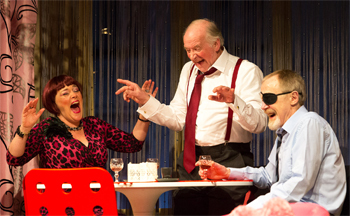 Alan Ayckbourn has written 77 plays but, until last night, I hadn’t seen any of them. As a theatre buff, I almost hesitate to make this admission; it’s a bit like a movie fan saying they’ve never watched a Bond film. Or a bookworm conceding they’ve yet to pick up Dickens. And so it was with a large degree of anticipation and excitement that I made my way to the Oldham Coliseum for a revival of Ackybourn’s Sugar Daddies. The last time I visited the Coliseum was for panto. I must have been in junior school, those halcyon days when a trip to the theatre was a major event. Today I still get a tingle down my spine as the lights dim and the curtain rises. Following a major revamp, the Oldham Coliseum is a pleasure to visit. Tucked down a side street in Oldham town centre, it feels a little like happening upon the Almeida in London’s Islington. The building’s lights twinkle and a fresh coat of paint sparkles in the moonlight. Once inside, the atmosphere is immediately welcoming, comparable to a big theatrical hug. Even the seats in the charming auditorium are comfy. Everything augured well. Despite being an Ayckbourn virgin, I recognise the names of his most famous plays – Absurd Person Singular, Absent Friends and A Chorus of Disapproval to name but a few. I hadn’t heard of Sugar Daddies but then there are many Bond fans who have never seen On Her Majesty’s Secret Service. 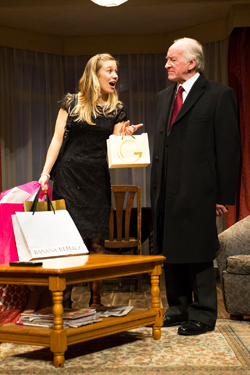 On reflection, I don’t think Sugar Daddies was the best play with which to pop my Ayckbourn cherry. Although the set was impressive (in particular the fragments of A-Z pages around the stage edges) and the actors admirable, the play didn’t really do it for me. There were some funny lines (thoroughly enjoyed by an appreciative local audience), a serious message and a couple of mesmerising monologues, but these parts failed to make a compelling whole. That’s not to say I regretted going: I loved the central performance by Sarah Vezmar, the young Norfolk naȉf whose simple act of Christian charity kick-starts the action. And I liked Paul Webster’s portrayal of Val, the sugar daddy of the title who is not all he seems. The play took the audience on a moral journey and, along the way, we were asked to reflect on how wise it is to trust another, and what form gratitude should take. All in all, it was a gently enjoyable night at the theatre, no more, no less, and its lack of excitement was no fault of the cast or the production team. The Bard of Scarborough may have written some corking scripts but this wasn’t one of them.